My Mom's dad (we call him Opa, the Dutch word for grandfather) has made one of the main tasks of his retirement to write a family history. He started off with the life story of HIS father (my grandfather), which he published at a little, family publishing house (the kind of place that prints out genealogies and small-scale projects) to hand out to his kids and grandkids. I received my copy when I was sixteen, and (being sixteen) had no clue yet of the importance of roots and heritage. Too busy finding out who I was, I didn't have time to wonder about where I was from yet. Later, I worked for two summers as a guide at a heritage museum, and started to learn about the importance of history, and what a resource our elders are, simply through the stories that have given their lives meaning. I spent two summers hearing older folks come through the museum talking about who they were, and how things are changing, and what still stays the same. Sure, these thoughts are nothing you can't find in Thornton Wilder's "Our Town," but it's amazing how the technology, the methods, and the setting change so dramatically, but we human beings are STILL just trying to figure out who we are and what we're doing, struggling to connect, to know and be known, and to feel like our lives were worth something, carving out a place in this world, like writing our names in water (kudos to John Keats for that one). I read that book finally when I was about twenty-four, just a little while before we found out my mom had stomach cancer. I was touched and moved by what, ultimately, read (to me) as a tender and admiring tribute to my Opa's father. What a blessing for the whole family, that we can have that story written down, as a piece of our heritage, that those stories will not be forgotten in time. It was an act of love for my grandfather to write a history of his father, both for his father, and for his children and grandchildren: he gave us the gift of knowing where we are from (or at least being able to). Here in Korea, families have amazing, long genealogies -- during the Korean war, one of my students told me how, as his family escaped their burning house in North Korea, fleeing the approaching Communist Troops, his grandfather ran back into the house to rescue the family genealogy. I shook my head in wonder, and he told me "It goes back thirty generations". Cripes! North America, because of the immigrant culture, doesn't really think too much of Genealogies -- especially when a lot of people are like my sister-in-law: "Irishambodiargentinianativenglisherpa" or, as she charmingly says, "Heinz 57". At best in North America, unless your progenitor rode the mayflower, genealogies are a hobby. 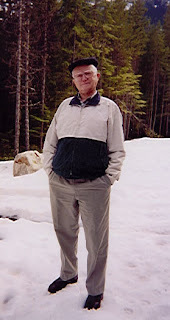 However, in reading my Grandfather's memoir, I realized that for many Canadians, especially second or third generation immigrants, the story of "How We Came To Canada" (or America) is as important a part of our self-stories as Koreans' "Your five-times-great grandfather served in the court of King Wi-na, but was executed during a purge when the next king took the throne". In that respect, as my friend Tamie says, I bow to my grandfather's effort to keep our family story alive, to make sure it is not forgotten in the past, as those who experienced it die away. I thank my grandparents for writing this down, committing it to paper, so that it will not be forgotten. "Later on when [my Oma's] Opa had his own shoe shop, he would not charge people if they could not pay. People held him in great regard for that. When I (Marijke) was visiting in Shalom Manor [an old-age residence with many Dutch immigrants] in 2005, I met Mrs. Zeldenrust, who lived in Hoogkerk many years ago and had known Tante Grietje [my grandmother's aunt, I believe]. Mrs. Zeldenrust's son told me about Opa's generousity and how peope appreciated that. I was amazed to hear that story forty-one years after his death." Forty-one years after his death, people still remember his acts of kindness and generousity. Sure, "Nazi Week" will garner more ratings on the Discovery Channel than "The Friendly Cobbler," but, dear readers, kindness IS noticed, and remembered, whether it's ever mentioned back to you or not. My man Jesus said, "Store up for yourselves treasures in heaven, where neither moth nor rust destroys, and where thieves do not break in or steal; for where your treasure is , there your heart will be also." Les Miserables: a gracious act by the Bishop pulls a life out of the gutter and redeems a character who'd given up on himself; Jean Valjean goes on to become the greatest of grace-givers, thanks (though he might never have found out) to a kindness done by a bishop who'd been robbed, and would have been within his rights to send our man Jean back up the river where he came from. gezellig rob. It's always good to know your family's history. by the way can you also speak Dutch?